Coyote tries a different approach to rid himself of an adoring cub. Will it work? The slingstone struck the crumbling stump with a hollow thunk, sending small splinters of half-rotted wood scattering in all directions. "Ha! I hit first!" Coyote ran to the rotten remnants of the tree to inspect the damage his well-flung stone had caused. "Look at the chunk it took off!" Rainpace moved in, too, surveying the results of Coyote's shot. "Next shot is from there," Coyote announced, pointing toward a little rocky knoll about 60 paces away. "All right, but I go first this time," Rainpace replied, hurrying toward the place indicated. "Go ahead, if you think it will give you a better chance. But I'll still hit first." Unknown to them both, a pair of eyes watched their every move from a wide hollow beneath a large fallen oak. It wasn't the first time Willow had followed them into the forest to spy on what they were doing; it had become an almost daily occurrence. She'd lay for hours, watching whatever Coyote and Rainpace chose to do for the evening, and when the pair decided it was time to head back to the Holt, she'd stay behind and try to do whatever they had been doing by herself. To her, it was the next best thing to actually being able to participate with them. She'd all but given up asking Coyote or Rainpace to let her come along. Coyote had given her the usual response when she'd begged to practice slings with them earlier this evening. "No, you're too young. You'd get hurt, or you'd get mad that you couldn't do it right and then we'd have to listen to you whine all the way home." "I would not. I've been practicing. I could hit anything you told me to," she countered, crossing her arms defiantly. "Sure," came the dismissive reply. Coyote wouldn't listen. He called for Rainpace and both young males headed into the woods. At least Rainpace had shot her a sympathetic look. But that was all he'd given her. Another stone went sailing toward the stump and hit it with a resounding thwack, drawing Willow's thoughts back to the present. It was Rainpace's turn to gloat this time; he'd hit the target with his first shot. "Lucky," Coyote smirked as the pair walked back to the stump. "Lucky my foot. Try picking a harder target next time." "Well, it's your turn to pick since you hit. Show me what a 'harder target' is." Rainpace surveyed the area until his gaze swiveled in the very direction of Willow's carefully-chosen hiding spot. "There, from behind the fallen oak. Let's see if you can hit it when it's not in your line of sight," he said. Coyote grinned, nodded, and led the way over to the next destination. Willow's eyes went wide. She'd be spotted for sure! Quickly, she scooped up her sling and the stones at her side and hurriedly tried to choose the best escape route. But try as she may, she couldn't move quickly enough. She felt fingertips grab ahold of the tip of her ear and pull. Wincing, Willow involuntarily rose to her feet. "Some little runt doesn't know the meaning of the word no," Coyote growled. Willow slapped Coyote's hand away and stood, defiant, crossing her arms over her chest. They might have found out she had been snooping, but she wasn't about to leave. Not now. "Why can't I watch? You won't let me play." "Play?" Coyote smirked. "This is not playing. Besides, wouldn't you be better off chasing frogs or doing whatever it is you like to do?" "I like to use the sling." "Just because your sire showed you how to pitch a stone doesn't mean you're any good. Rainpace and I aren't going to waste our day listening to you whine when you can't hit the target." "I won't whine, because I will hit the target!" "No, you won't. You couldn't hit that stump if you were standing right in front of it." "I could, too!" Willow's lower lip began to quiver into a pout. "Let her try it, Coyote," Rainpace said. "When she misses, she'll leave us alone." Coyote glanced at Rainpace, then back at Willow again. **You realize if we let her do this, she's never going to leave us alone? ** he locksent to his friend. "I won't miss," Willow stated, not privy to the silent conversation between the two men. "All right, fine," Coyote snapped, making his way back closer to the stump. "We'll see if you can make a shot." "What about the one from behind the tree?" Willow asked. When she made that shot, they'd definitely see that she was as good -- if not better -- than the two of them! "That's too hard for you," Rainpace countered, following Coyote's footsteps. "We'll try something easier first. If you hit that, then maybe we'll try something harder." "Fine," Willow said, shadowing Rainpace to the spot Coyote had chosen for the 'test.' She'd show them she could hit the easy target, and she'd show them she could hit the harder one after that! Then they'd be sorry they hadn't invited her all along! "Shoot from here," Coyote said, pointing at the ground and taking a few steps back. "Let's see how good you are." Willow shot Coyote an, "I will," glare and marched over to the spot. She rummaged through her pouch of slingstones to find the perfect projectile, then fit the missile into the wide pouch of her sling. She sighted the stump, lifted her arm above her head, and took aim. She concentrated as she felt the air whipped by the whirling sling overhead. This shot was easy, she knew. She'd hit this and show them how good she was. The sling whirred until Willow felt it had the proper momentum. Then, she lifted a finger to let one end loose and let the stone fly. At the last possible moment, she felt the strap of the sling glance off her finger. The stone shot out at an angle and missed the stump by several feet. Coyote burst out laughing. "See what I mean? I think you need to go back to the holt and practice, runt." Willow gaped at the stump in disbelief. She had missed! She'd messed up and she had missed! "I can hit it!" she cried, fingers scrambling for another stone. "Let me try again!" Coyote shook his head. "You had your chance, cub � you're not good enough." "It's getting late, and it smells like rain," Rainpace chimed in. "We should get back." "I can hit it," Willow repeated, her voice increasing in pitch. "Give me one more chance!" Coyote frowned. "See? You're whining." He glanced at Rainpace. "Didn't I tell you she'd whine?" Rainpace replied with a nod. The two men gathered their things, but Willow was determined to show them she knew how to use a sling. In desperation, she loaded up another stone, fired, and missed. She tried another and another, all which went wide from their mark. "I can do this!" she repeated, and grasped another stone to try again. But Coyote and Rainpace were already gone. All that remained was Coyote's laughter echoing back to the clearing as the pair walked away. No one but Willow heard the crack of her last flung stone striking the stump. Dawn arrived in a grey haze of fog and incessant drizzle. By the time the sun had come up, both Coyote and Rainpace had retired to Goldspice's den to gamble and the earlier challenge in the forest had been long forgotten. Coyote had the throwing stones in hand, hoping, willing, he'd roll the two red marks he needed to win. He cupped his hand to an ear and shook the stones within. "C'mon, I know those reds are just waiting!" "Think you can hear them in there?" Goldspice giggled. "It's time. I can feel it," Coyote replied, casting the stones onto the den floor. He rolled a red...and a green. "Not this time," Rainpace grinned. "I win, and that turquoise rock belongs to me." The trapper deftly scooped the item, and other items that had been wagered that round, into his hand and deposited them in his own cache. Coyote frowned. "I'll get it back." "Not today," Goldspice said, leaning back. "I'm tired. We can take this up again tomorrow if you like, but I want to get some sleep." "Tomorrow then," Coyote agreed, then felt a nudge on his arm. "What?" Rainpace was grinning, gesturing at the small shape that was perched on a branch just outside the den's entrance. **I think she likes you,** he sing-songed at his friend. Something about the cub's tone made Coyote bristle. How dare she talk to him that way? He'd grab ahold of her ear and take her back to the den to her sire. Why wasn't she being Bowflight's usual shadow? Coyote had enough � he was tired of this little tagalong. He went to push himself up, when something clicked in his mind. No, that's what she wanted him to do. She wanted him to go out there, didn't she? Well, he wasn't going to do it. He crossed his arms just as Willow had done before and locked gazes with the cub outside. As far as he was concerned, this was a challenge. It was a challenge that was immediately accepted. Willow readily and evenly returned Coyote's glare. **Coyote, what are you doing? ** Rainpace asked. Both he and Goldspice had noticed Coyote's silence and were now watching him quietly bicker with the cub outside. **You're not seriously going to have a stare down with a cub, are you? ** Goldspice added. **I won't move until she leaves! ** Coyote shot back, indicating Willow's whereabouts in his sending. **She can sit there if she wants,** Goldspice said. **Not while I'm sitting here. ** Coyote growled for emphasis. **It's not your den, and not your decision,** Goldspice retorted, becoming quickly annoyed. **Once you leave, she'll leave, too,** Rainpace added. Coyote snarled. **I should let her win? ** He noticed Willow's brows lower slightly from her vantage outside, noticed the corner of her mouth curl up into a slight smirk. And then, Coyote flinched. He wasn't sure whether it was Goldspice's outburst or Rainpace's moving off to the side that made him glance sideways for that split second, but something drew his gaze away. In that short moment, Willow rightfully declared herself the winner of the staredown, stood, and turned to leave. Coyote rose to his feet with a frustrated growl. The cub had won! Rainpace and Goldspice had griped at him, distracted him... and now Willow had won! Didn't they realize that Willow wouldn't give up now that she knew she had an edge in? How in the names of the firstcomers would he ever get that cub out of his hair now? "Let it go, Coyote," Rainpace sighed. "Just ignore her for a while and she'll leave you alone." "Ignoring her won't work, you know that." "I don't know that. I'm willing to give it a try." "C'mon, this little prank isn't going to hurt anyone � save maybe for Willow's pride. And it wouldn't hurt to take that down a notch or two anyway. You'll see � this will work, and we won't have to worry about her begging to come along any more." "Why can't you just tell her to go away instead?" "It didn't work before. It won't work now." Rainpace bit back his next reply and sighed instead. Once Coyote had something in mind, it could be impossible to get him to let go. Rainpace had learned long ago that sometimes it was best just to let his friend carry on. He had to admit, though, he couldn't understand what Coyote had against Willow practicing slings with them once in a while. Rainpace had nothing against it. After all, hadn't he and Coyote all learned from watching their betters, too? Moments later, Rainpace spied Willow hurrying up the path to the knoll where he and Coyote were standing. The smile on the cub's face stretched from ear to ear. **Because, my friend, a good prank is even better when more people can see the outcome! ** The side of Coyote's mouth curled upward in a grin. "I'm here!" Willow called, panting. "I hurried when you said you wanted to see me." Coyote tried his best to keep a straight face. "I'm glad you came so quickly." "What did you want me to help you with?" Willow blurted, shifting her weight from one foot to the other. She couldn't believe that after all the times he'd turned her away, Coyote had actually asked her to help! "Well, I set a trap, and I know I caught something in it last night, but I need to go do something else...for my sire... and just can't get to it right now. Do you think you could check it for me so I don't lose the catch?" Willow's eyes lit up. "I sure can! Where is it?" Coyote smiled and bit back the chuckle that threatened to well up. The one good thing about cubs was that they were so gullible! It had been a long time since someone had fallen for a trick so easily. He cleared his throat. "It's over the ridge just past the willow grove. You know the hollow next to the big rock that tumbled down from the hill the last time the ice thawed?" "That's where it is. Right next to the rock. You can't miss it." The smile that broke across Willow's face was priceless. "I'll get it! And I'll reset the trap for you when I'm done, too!" "Only if you want, cub." "All right, then. You'd better hurry before something else gets to that trap." Willow bolted toward the grove without another word. When she was safely out of sight, Rainpace broke his silence. When Willow came back to the holt proper crying and reeking of white stripe stink, more than just the cub were upset. Neither herbal concoctions nor a few good scrubbings removed the overpowering smell, and Willow was forced to spend most of the next few days alone in a spare den until the stink went away on its own. The cub had kept no secrets of who had tricked her into going to the hollow that had been the skunk's home. Bowflight and Finch wasted no time in giving Coyote a piece of their mind, and his sire had bellowed at him a good long while, too. After all, the whole Holt � and not just Willow � would have to put up with smelling that awful stink for days. However, to Coyote, any trouble this prank had got him into was worth it. He figured he'd made it clear enough that he wanted nothing to do with that little shadow. Willow would think twice about trying to follow Rainpace and him around all the time now. He was sure of it. His assurance was shattered days later after the skunk musk had mostly worn off and the angry cub met Coyote at his den door. She plopped herself down in the den's entranceway so he couldn't escape � at least not through this exit � and crossed her arms over her chest. Coyote wrinkled his nose when he both spied and smelled the cub. "Go away, runt. You still stink." "That's your fault," the cub snapped. "And stop calling me a runt. I'm not a runt!" She shot a gaze at him that was full of daggers and venom. Coyote had never seen Willow so angry before. Her next question took him completely off guard. "Why did you tell me to go check a trap that wasn't there?" He hadn't expected her to ask that question outright. He couldn't come up with an immediate answer. Willow didn't give him much time for a reply. She kept firing question after question at him. "Did you think I couldn't check a trap, either? Don't you think I can do anything?" Coyote scratched his head. "I'm sure you can do some things, cub. But you're not very good at doing the things that I like to do. You're too impatient." "I'm better than you know � both at slings and with traps. I got better because I watched you. You and Rainpace both. But you never gave me a chance to show you what I can do. The only time you've let me even try to do something with you and Rainpace, you didn't even give me time to show you I could hit that old stump." "And you didn't hit the stump, did you, cub?" Willow frowned. "I did, too! Not when you two were watching. But I did after you had gone." Coyote sighed. What wouldn't the cub say just so she could stay around? Was there any way he could change Willow's mind about wanting to be a constant shadow? He met Willow's gaze. She had been blunt with him. He would be blunt with her. Maybe that would work. "What do you want me to do, cub?" Willow's expression softened at the question, then took on a pleading look. "I want to show you I'm good at something. But how can I do that if you don't even give me a chance?" 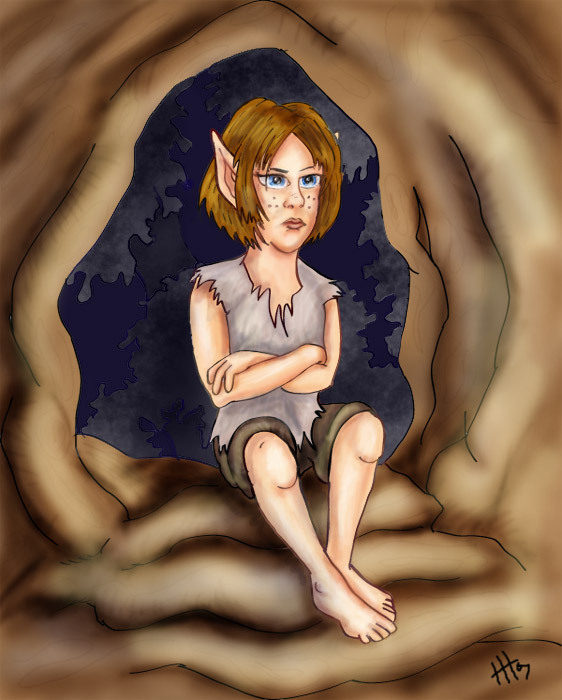 The older elf's brows lowered and he looked at his feet as he felt a small pang of guilt. She could very well have taken lessons in wheedling from him to try and melt his heart like that. A part of him � a small part of him, for the smallest of moments � felt a little flattered that Willow suddenly seemed to want to be in his company so badly. However, it was only moments later when a larger part of him � the part that could wiggle out of anything � whispered that he was in danger of falling for one of the oldest tricks � the wolf-pup eye trick. It was then, like a bolt of skyfire, that an idea struck him. Once again, he met Willow's gaze. "If I give you one more chance to do something I ask � anything � and you can't do it, will you stop pestering Rainpace and me?" Willow thought for a moment. Coyote's request seemed fair enough. She finally nodded. "If I can't do it, I'll leave you alone. I promise." "And you'll do anything I ask you to?" Coyote grinned. "Then we have a deal." "It's perfect," Coyote quietly gloated. He spoke so softly even Rainpace could hardly hear him. "There's no way she can follow through with this. She'll be out of our hair for good." Rainpace glanced out across the narrow clearing at the tall tree that had, not long ago, been clipped off close to the top by a bolt of skyfire. Bees had found the tree to their liking and had since made the hollowed tree their home. It appeared to be a big colony of bees, too � even from across the clearing, the trapper could see small flecks of black darting in and out of the opening about halfway up the trunk. Coyote was right, he decided. No one in their right mind would get close to that tree. It seemed as though Coyote's plan really would work. It came as a surprise to both Coyote and Rainpace when Willow didn't hesitate to take up Coyote's challenge to bring back a piece of honeycomb from that bee tree. Rainpace was especially surprised. When Willow immediately shed her cloak and strode across the clearing with determined footsteps, he hollered after her to stop. She paid him no mind, so he turned to Coyote instead. "You have to stop this. This is going too far. She's going to get hurt!" Coyote crossed his arms and made no move. "I know a bluff when I see it. She's waiting for me to call her back. She wants me to say this is a trick. She wants me to lose." Willow reached the base of the tall tree and began circling the trunk. Rainpace bit his lip. "Coyote � what she wants is for us to like her. Don't you see she'll do anything we ask? She's not going to stop until she's stung to death!" He took a step forward again, but felt Coyote's hand on his shoulder, holding him back. "Just wait," Coyote answered. "She can't bluff much longer." Willow took a deep breath as she studied the tree trunk, looking for the best way up. She didn't think she'd have much trouble climbing the tree, but branches on half-rotten trunks could crumble unexpectedly and she didn't want to risk a fall. How hard indeed. She gazed up the trunk and at the large opening above. She could hear the bees buzzing from here. She placed a hand on the tree trunk and thought she could feel the tree vibrating in tune with the noise. How many hundreds of bees were inside the dead old trunk? 'I've got to do this,' she told herself, trying to quell the trickle of anxiety welling in her stomach. 'It's now or never.' With that thought, she took one last deep breath and leapt up to grab the lowest branch. Once the ascent began, Willow focused on moving upward until she heard a call to come back down. She ignored it, instead picking her way to the next branch, then the next, slowly climbing higher and higher. They weren't going to tell her she didn't even try! Then, something happened. She began to tune out the sounds of the buzzing bees that grew louder as she pulled her way up the branches. She found she still didn't feel threatened. Once again, she moved her eyes to the hive's opening several feet above her. The opening above became her sole focus. She climbed higher than she had dared or meant to before, and, suddenly, everything seemed to fall into place. Willow hardly noticed the shouts of the two young males now below her at the base of the tree telling her that she didn't have to do this, saying she should climb back down. She paid no mind to the black and yellow striped insects as they buzzed around her, landing in her hair, on her face, on her shoulders. They weren't stinging her. She found, as she ascended, a certain part of her inner self growing calm, serene. She wasn't sure she had ever felt that way before. When Willow finally reached the hive entrance, she easily reached inside to retrieve a chunk of the golden, waxy comb. It emerged near-covered with bees and dripping with beesweets. Willow gently shook the bees loose and gazed a moment at the prize she had just won for herself. Then, she secured the honeycomb between her teeth to make climbing easier and slowly began her descent. She hadn't been stung. Not even once. When she reached the lowest branch, she leapt down next to the two slack-jawed, wide-eyed young males. With a smirk, she grabbed the end of the comb and bit off a good chunk. Golden honey oozed down her already sticky chin as she chewed the honeycomb and savored the sweet amber liquid within. "You should try some of this. It's good," she said matter-of-factly with a mouth full of beeswax. Then, without another word, and without offering either of them a piece, she strode across the clearing, picked up her cloak, and walked back to the holt. "Good shot," Rainpace called, making his way to the oft-used target to inspect the damage the last stone had done. "You hit first. Next choice is yours," Coyote added, reaching into his slingstone pouch for another missile. Willow grinned, surveying the area, trying to figure out the best place to set up the next competition. Her gaze settled on a target that had been named before, on an evening not too long ago. "There, behind the big fallen log," she finally announced, gesturing toward the spot. "That's too hard for you," Coyote replied. "She won the last shot," Rainpace countered. "The choice is hers." Coyote set his jaw, then looked from Willow to the husk of the tree lying paces away. He took a deep breath, relaxed his jaw, then nodded. "Your shot first, run...er, Willow. Let's see what you can do."